When we first started dating, the BF was not a fan of raw oysters. He told me about how once during a work dinner he had access to an unlimited supply of freshly shucked oysters and didn’t take advantage of a single one. I was green with envy. If it was me in that situation I would’ve lingered by the raw seafood for an embarrassingly long time. So when it came to light recently that I’d never been to Oyster Boy while the BF has, the situation had to be rectified. 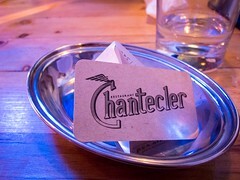 Atmosphere: I made reservations for a Friday night and when we arrived at 7:30pm the restaurant was already in the full swing of dinner service. We were seated in a cozy table at the back of the restaurant. Each wall was filled with oyster themed art, old photographs and maps. 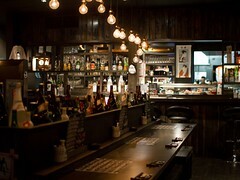 The decor and light wood furniture reminded me of a boat cabin, a very fitting feeling. 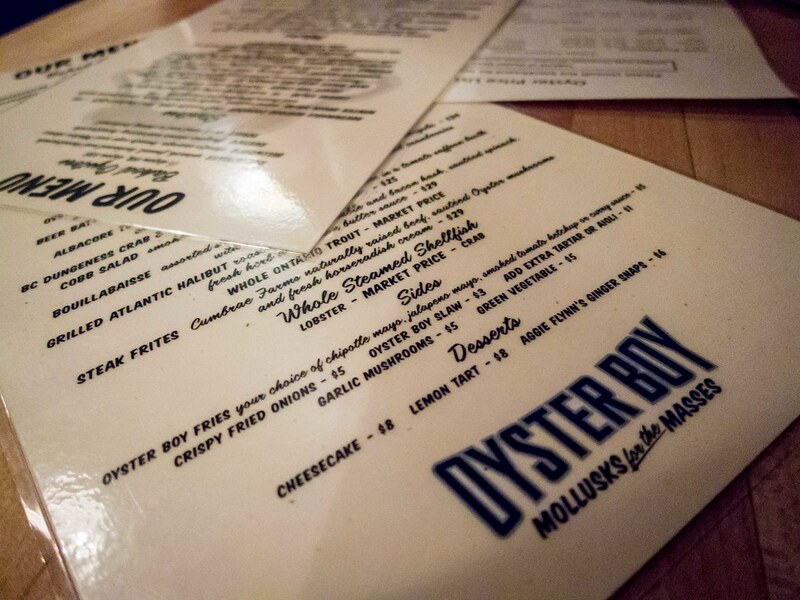 I’d recommend the restaurant for a comfortable date night or casual group dinner; Oyster Boy really is a fit for any occasion that calls for great food. Service: After battling Toronto traffic we parked and made it to the restaurant 5 mins past our reservation time. We were seated right away with menus. Our server came by to take our drink orders and listed off the daily specials. 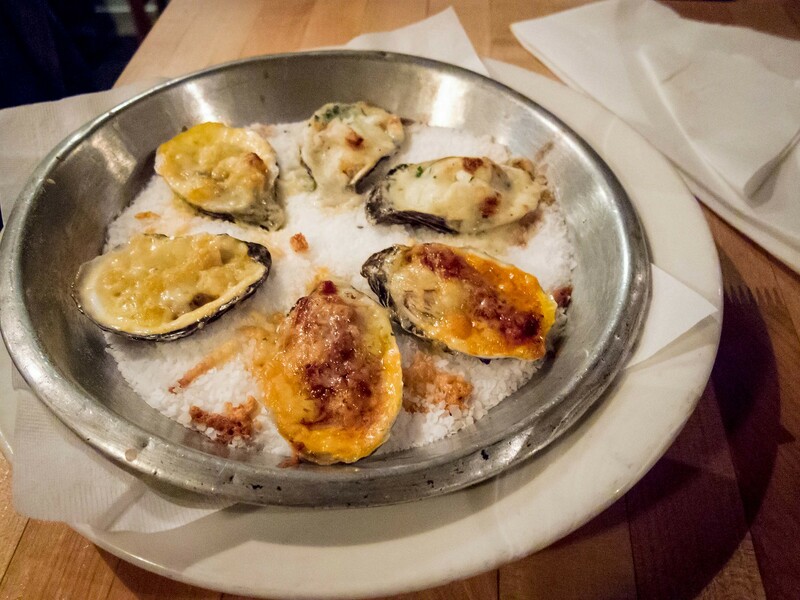 We had a hard time deciding on which of the baked oysters to go with and she gave us more detailed tasting notes on each of the four choices that helped a lot. 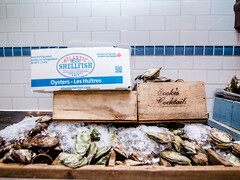 Our raw oysters came right away but there was a bit of a lag before the hot entrees arrived. Our server came to check on us before we even noticed the wait, which was great. 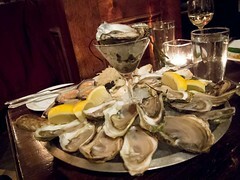 Food: To start we ordered a half dozen Pemaquid oysters from New England. I liked that the menu included the size of the oyster, which helped us decide which one to try. After indulging all of my oyster cravings the BF is now more open to eating them and becoming proficient in shucking. He does prefer the sweeter, smaller, not so meaty varieties and the Pemaquid were perfect. 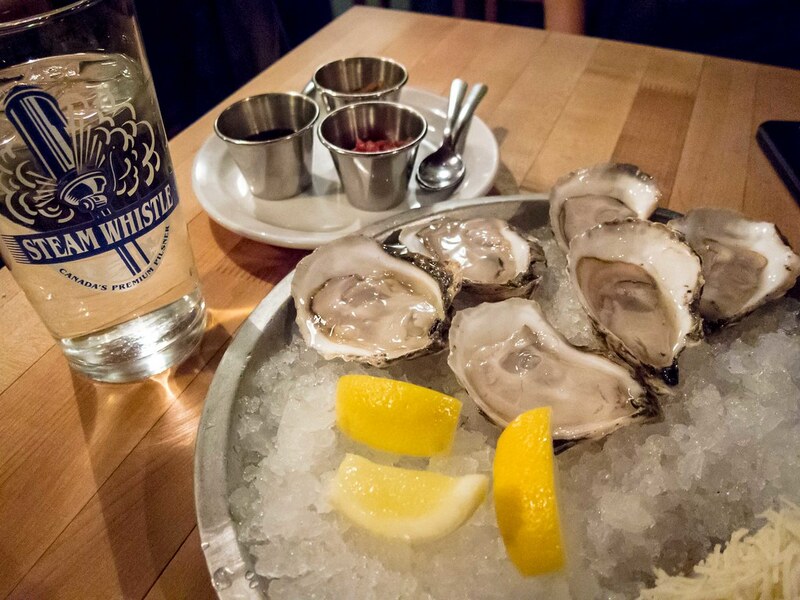 Following this, we ordered two each of the Bellwoods, Rustico and Royal baked oysters. These little shells were hot, covered in melted cheese and full of broth. My favourite was the Royal because I liked how the sherry balanced the seafood flavour of the oyster. The Rustico tasted like a pizza and the Bellwoods had a nice spicy kick. 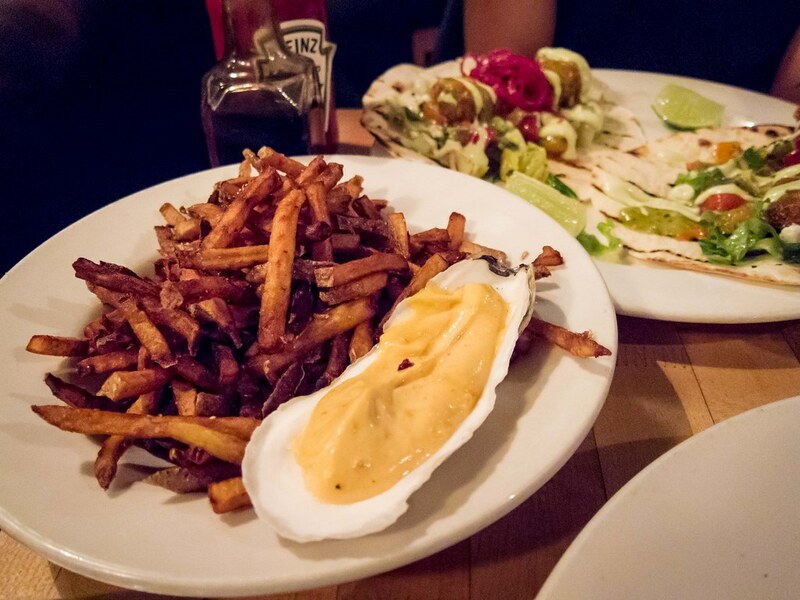 For entrees, the BF ordered the daily special of fish tacos, I had the Dungeness Crab and Bay Scallop pappardelle and we split a plate of Oyster Boy Fries with chipotle mayo. 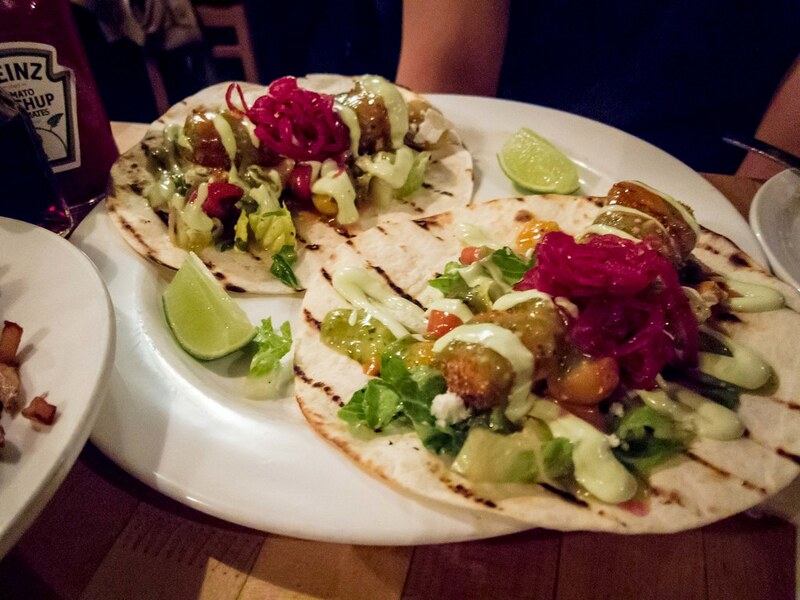 The tacos were really large potions, using at least 6′ flour tortillas (maybe even 8’?). Wedges of lime were served alongside but they weren’t necessary. The sauce on the taco itself had plenty of acidity already. The dish was ok, solid but it was hard to compare to the amazing-ness that was the pappardelle. 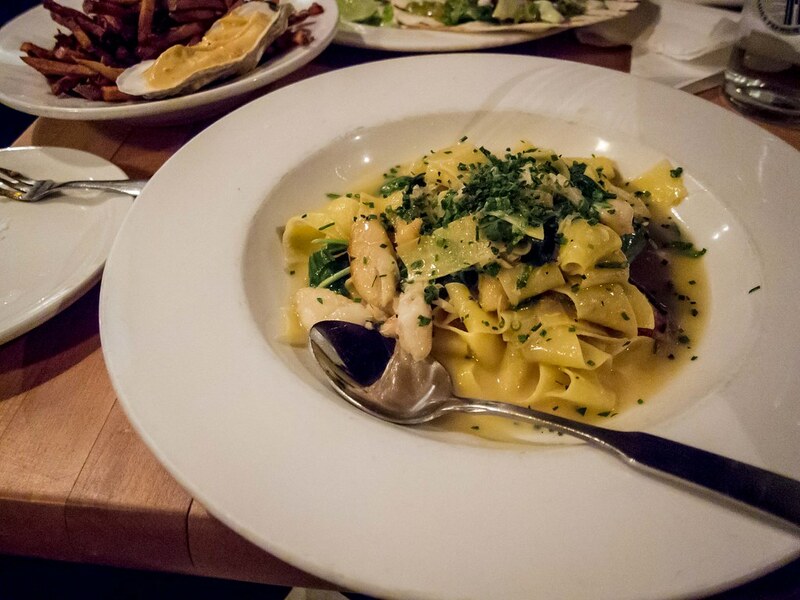 The pasta was loaded with tender seafood and the lemon butter sauce was rich and savoury in flavour while being light and smooth in consistency. Each strand of pappardelle was thin and served al dente. This was the kind of dish that makes me want to re-visit a restaurant the next day. As a side, the fries were ok and I liked the use of an oyster shell to house the chipotle mayonnaise. I’ve heard great things about Oyster Boy’s onion rings and will have to try that next time. Near the end of our meal, our server asked my Twitter handle and it turned out she runs the @OysterBoyTO account. She asked if I was interested in an Oyster Boy T-shirt and I got to take home this sweet T-shirt, the icing on the cake of a great dinner. I just discovered your blog recently. Just wanted to say I love reading the reviews you write =) I’ll definitely need to visit some of these restaurants that I haven’t been too! Bringing my ma for mothers day. 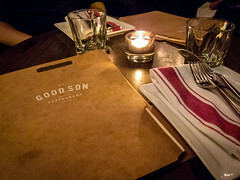 She choose seafood and your review help finalize this nice cozy spot. I hope you both enjoy the meal!